It’s almost inconceivable today, but not so long ago, to be considered truly ‘luxurious’, a watch had to be made from one of a handful of traditional ‘luxury’ materials. The case needed to be platinum or gold (whether rose, yellow or white). If affixed to a bracelet, again, those precious metals were required to be used in its construction. If borne on a strap, that simply had to be crafted from fine leather—preferably something exotic like ostrich, crocodile or alligator. Times have changed, however, and so have timepieces. Our perception of what makes a luxury watch worthy of that appellation was forever altered by the iconoclastic work of a few key players in the 1970s and 80s. Hublot was among the most important. The company, which takes its name from the French word for ‘porthole’ (a motif reflected in the distinctive Hublot screw-down bezel), launched in 1980 with a philosophy centred on fusion. This was embodied in the brand’s debut timepiece, the first gold wristwatch in history to be carried on a natural rubber strap. ‘Fusing’ a gold case with this non-traditional strap material was a revelation—and sparked a revolution. Founder Carlo Cracco spent three years and almost a million dollars developing the special rubber for the strap—hardy, crack- and stain-resistant, fused with steel for strength and comfort, and blended with a concentrated vanilla to remove the formidable rubber scent. Groundbreaking as it was, Hublot’s inaugural watch was so far ahead of its time that it flopped when first launched at the BaselWorld fair in 1980. Nevertheless, thanks to the patronage of pioneering clients including the Prince of Monaco and the kings of Greece, Spain and Sweden, it swiftly became a favourite of the late 20th century haute-monde. In 2004, watch industry legend Jean-Claude Biver assumed the CEO seat at Hublot (he remains the company’s chairman today). Biver was intent on taking The Art of Fusion to new heights of technical wizardry and creativity. His arrival at Hublot’s helm was heralded by the introduction of the ‘Big Bang’ chronograph at BaselWorld in 2005. Met with an enraptured response, demand was as immense as the watch's critical acclaim—the Big Bang chrono won the design prize at that year’s Geneva Watchmaking Grand Prix and a clutch of other international accolades. 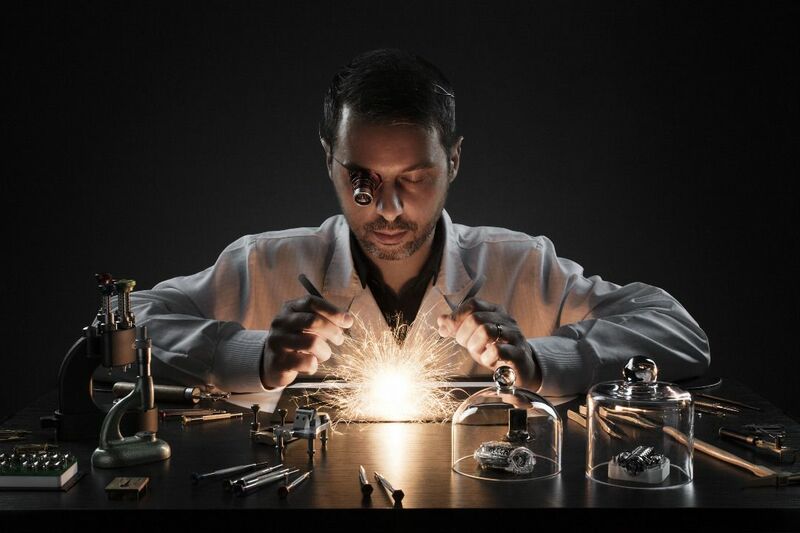 Biver and his successor as CEO, Ricardo Guadalupe, have championed numerous feats of artistic fusion at Hublot, including the creation of patented alloys such as Hublonium (magnesium and aluminium), King Gold (gold and platinum), and Magic Gold. This last remarkable material—a fusion of 24-carat gold and ceramic—is virtually scratch-proof. The company has also crafted timepiece cases in carbon fibre (melded with gold or titanium, in a further nod to the art of fusion), clear sapphire crystal, Texalium (a carbon/aluminium composite), and volatile, ultra-rare element Osmium. Innovative case materials would be meaningless without serious horological mojo at the watches’ core. And indeed, despite the modern aesthetic of the brand’s movements, traditional watchmaking craftsmanship is Hublot’s lifeblood and beating heart. “The Art of Fusion finds its expression far beyond the materials,” says CEO Ricardo Guadalupe. “It’s a lifestyle, it’s a mindset that guides all Hublot’s actions and partnerships. To us, The Art of Fusion means linking yesterday and today with tomorrow,” he explains. One glance at a Hublot watch, and you’ll see exactly what he means.